I live in Sandgate, Kent, right by the sea where I am constantly inspired by my surroundings and the ever changing sea and skies. 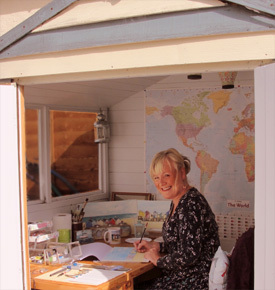 I specialise in seaside art and am well known for my paintings of beach huts, lighthouses, fishing boats and seaside scenes. Drawing was my hobby as a child, Christmas and birthdays were never complete for me unless I received a drawing book and new crayons. Art continued to be my hobby for many years then I went to Catalonia in Spain on a painting holiday and I have been painting ever since. I enjoy painting in watercolours and have my own unique style, using the paints to create very bright colourful paintings. Most of my paintings are available as prints and cards. I have been selling my paintings on my own website and gallery websites for 10 years. My paintings have sold in the USA, Canada, Australia and in Europe. I have been successful securing licenses with several companies including; biscuit tins and packets for Moores Biscuits, tiles for Bridgeness Ceramics and Cross Stitch Kits for DMC Creative. Commissions are welcome, they are a big piece of my work and I have created giant 4ft x 5ft watercolours and prints for cafe's and restaurants. if you would like to commission a painting please take a look at the commissions page where I give some sizes and prices. If you want to ask about a painting for sale you can contact me by telephone, email of the contact page here on this website. I hope you enjoy my website. Thank you for looking.